A new wave of architects in Poland are coming up with novel ways to use traditional building components, whether it's sturdy steel and concrete or the ergonomic allure of wood. Culture.pl presents the most exciting projects and award winners of the past year. The building that inspired the biggest buzz this year was Stefan Kuryłowicz's (designed with his team) new shopping complex at the former site of the legendary Supersam supermarket on Plac Unii Lubelskiej in Warsaw. The capital is also seeing a number of new projects from world-class architects, such as Daniel Libeskind's Złotą 44 skyscraper - incidentally, the tallest apartment building in the EU. As for public buildings, the Museum of the History of Polish Jews , designed by Finland's Rainer Mahlamäki. 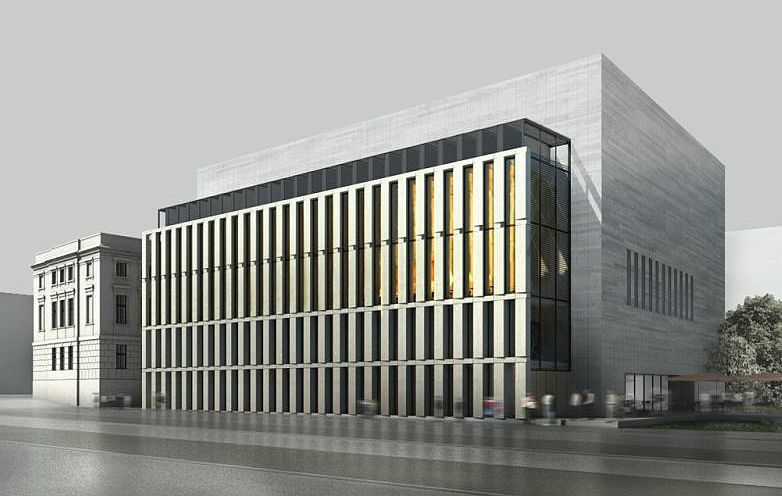 Next to come is the new Szczecin Philharmonic designed by Estudio Barozzi Veiga. Of all the newly-blossoming public institutions, the Museum of Architecture in Wrocław stands apart. And many public institutions are following suit, creating architetural structures that attempt to answer the question of what contemporary architecture means today and how to make pulic buildings as user-friendly as possible, spotlighting the singular profession of the architect. Kraków's National Museum, in collaboration with the Architecture Institute, put together an exhibition devoted to one of the most significant architects of the turn of the last century - Adolf Szyszko-Bohusz. 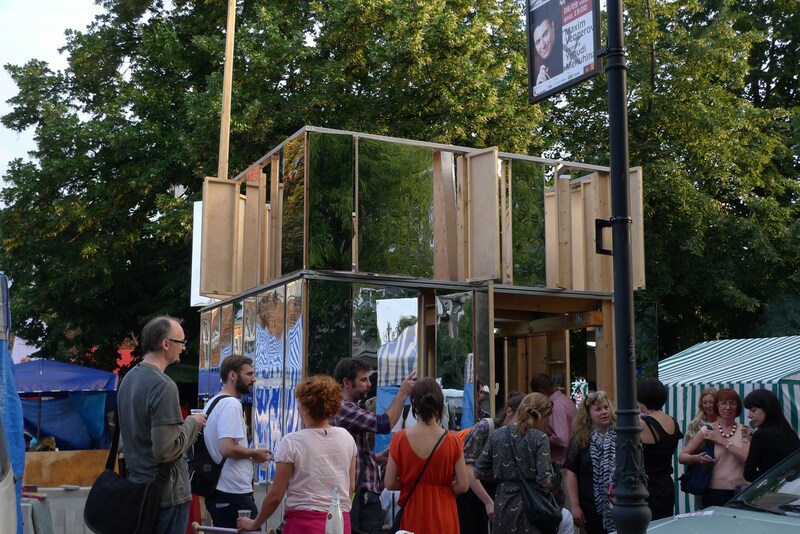 The Centre for Architecture put the "new Polish home" into perspective, paying heed to the most functional models for single-family homes across the country. The direction that architecture in Poland is taking today appears to intersect the individualist aesthetic with the needs of the public at large, particulary in the case of big cities. Protests against the "barbarian" politics of residential developers who flatten national treasures to make way for new apartment blocks are gaining speed and volume. Even less popular are the billboard companies whose strategy is to cover every available façade with advertisements. 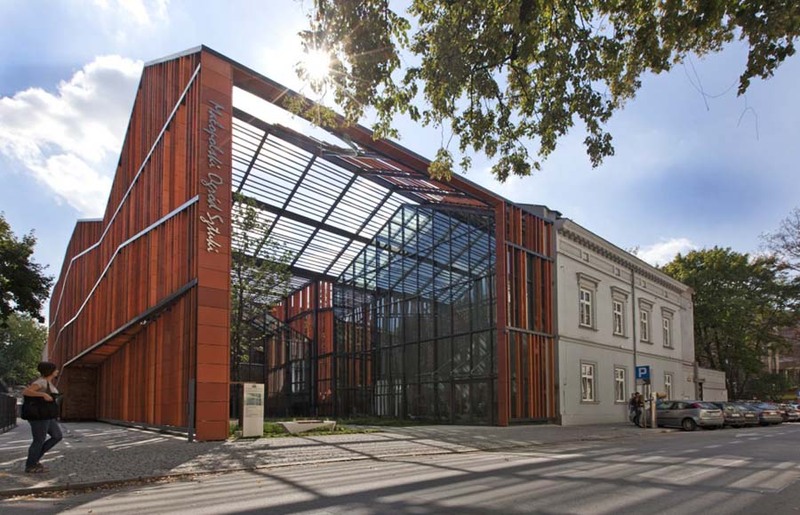 The most historic of all Poland's libararies recently added a new wing designed in a fully contemporary style. The Warsaw-based studio of JEMS Architekci. Designers deftly matched the old-fashioned structure with the new component, without allowing either to dominate the Louvre-inspired cube, embellished with the delicate, transparent façade. The Building - Museum of the History of the Polish Jews - Video Tour from Culture.pl on Vimeo. The ruins of the ghetto make up the foundations of the highly-anticipated building dedicated to the influential Jewish presence in Poland. The collection and exhibitions of the Museum of the History of Polish Jews tells the centuries-old tale of Jewish history in the nation. The serene, geometric form of the structure is broken with a symbolic rift that reflects the tragic turn of events brought on by the Second World War. The building was designed by the Finnish architect Rainer Mahlamäki of Lahdelma & Mahlamäki Architects. Mahlamäki avoided the use of concrete and opted insead for a glass façade. Within, he used a wavy shotcrete material that is similar to sandstone in its welcoming texture. He aimed to bring a more pleasant air to the site, explaining, "Light was needed here. Natural, pure illumination. The type of lamps that would brighten up the surroundings and bring out new tones in the subtle background, as might crystal in the mountains or a waterfall in the darkness of a wood". 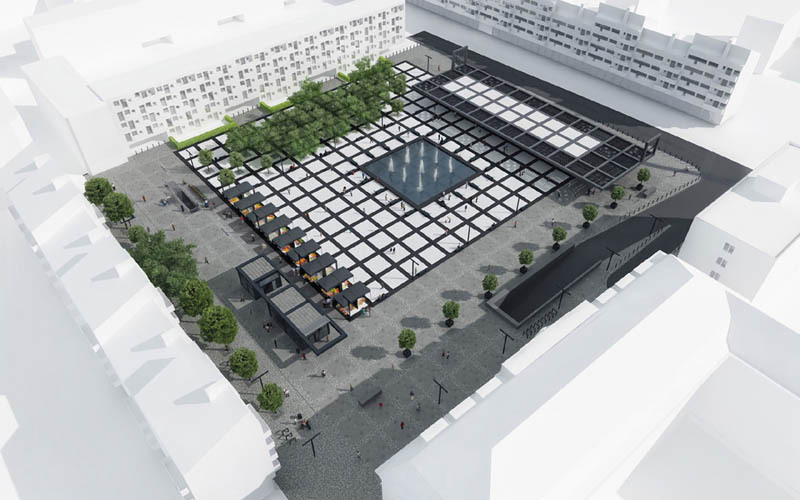 The design for Wrocław's historic New Market Square is meant to build up on the modernist ideas of the 1960s, taking its cue from the residential buildings built on the ruins of World War 2. Roman Rutkowski created a plan that took into consideration not only the competition guidelines, but also the ideas of post-war architects hoping to revive the area, transforming an underground fallout shelter into a parking lot, maintaining a geometric base for the entire square. The former flower stand is to be the site of a water sprinkler, itself a reference to the pre-war statue of Neptune that stood here before the war. For the time being, concrete slabs in the shape of lounge chairs fill the space, with market stalls in the western end building on the site's traditions of craftsmanship and commerce. The Poznań-based studio of Ultra Architects opted for wooden panels on a concrete base to create a unique design for a seaside home. The design brings together a sturdy construction with the ambiance that references the surrounding trees - an ideal coupling when building on terrain with high groundwater levels and unpredictable foundations. The home has won one of the main prizes of the 17th edition of the "Polish Cement in Architecture" competitions organized by the Polish Society of Architects and the Association of Cement Producers. The new headquarters for the Foundation for Polish Science sprung up in an upmarket residential quarter of Warsaw speckled with villas. The structure takes a green turn with a façade covere with over 20 types of foliage. 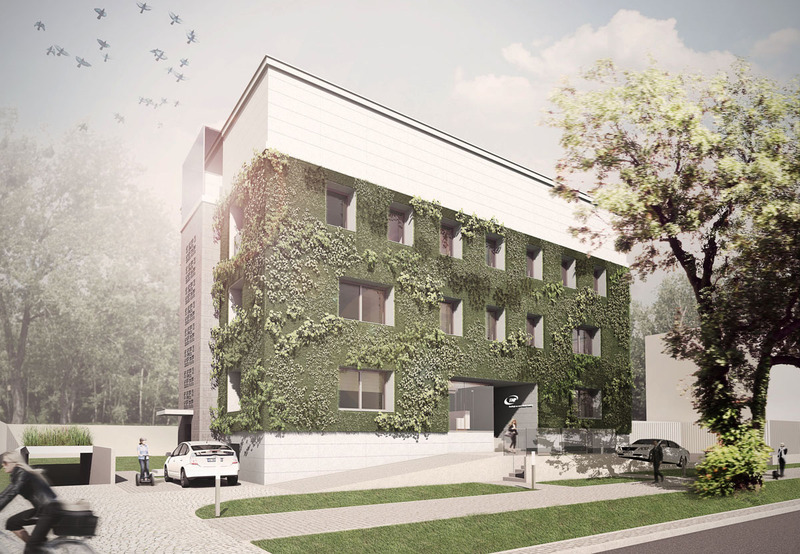 This eco-minded approach also works to improve the microclimate of the building itself and is among the first projects of the sort in Poland. The building - originally built in 1933 and partially damaged during the Second World War - got a contemporary twist thanks to the efforts of FAAB Architektura. The sustainable aspects of the development are extended through the adoption of recycled materials for construction, as well as a rainwater adaptation scheme and the re-use of bathwater in the toilet. A treehouse for grown-ups is basically what this B&B in the popular resort district of Nałęczów might be described as. 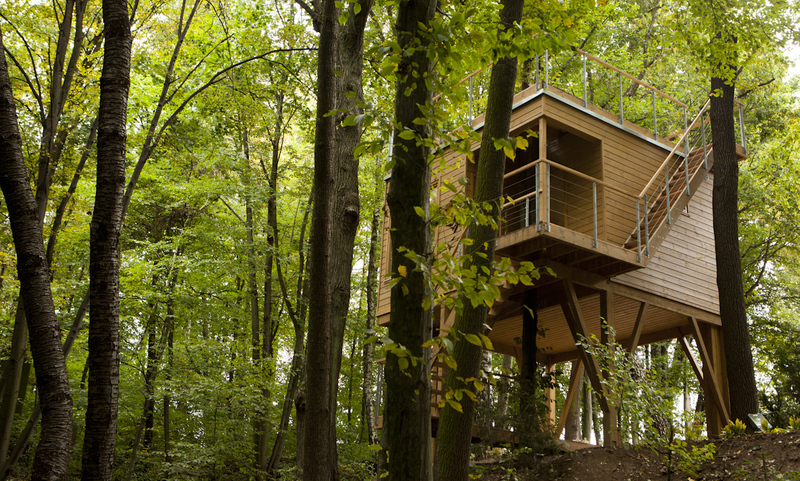 Run by a young married couple by the name of Fraszków, it takes the fantasies of youth and brings them into reality with a full-fledged family of treehouses nestled in the woods, designed by Piotr Jakubowski. 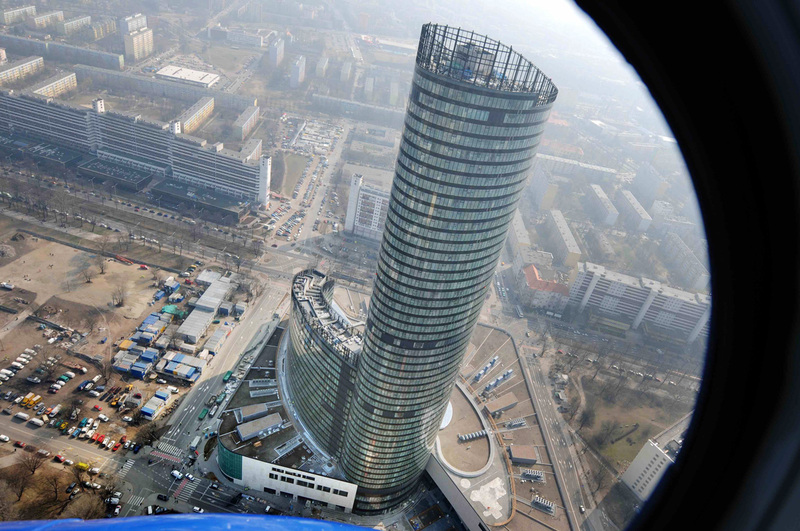 Sky Tower in the Wrocław district of Krzyki is currently the tallest building in Poland at 212 metres tall - and among the 10 tallest buildings in Europe. It serves as a commercial centre (opened in 2012), as well as offices and 212 luxury apartments. The first project for the site - which once was home to a communist-era office building - was designed by the Warsaw-based bureau Walas. Later the FOLD studio was added to the team and the over-reaching project for 6 individual segments was whittled down to three. 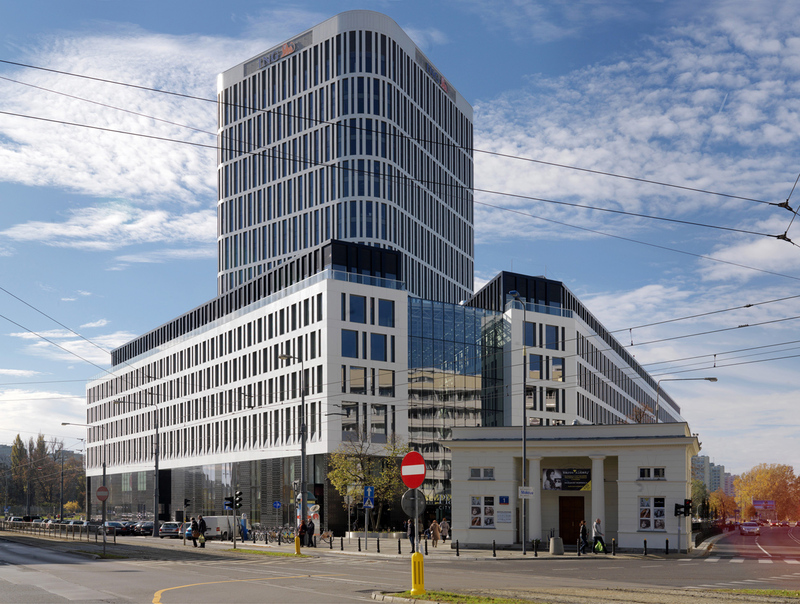 The latest building designed by the Grupy 5 design team carries on the spirit of developing the rather barren Wola district of Warsaw into a burgeoning office district. Each floor of the structure is adaptable for various purposes, wether it's a bank or a start-up. The glass façade reflects the unique structure of the post-industrial adapation of the museum across the street- the Warsaw Rising Museum. The project was a controversial one from the very start as the building designed by Kuryłowicz & Associates replaced one of the most legendary modernist buildings in the capital. Constructed on the intersection of two major Warsaw districts - Śródmieście and Mokotów. Yet there were already plans for a 70-metre-high skyscraper for Polish Radio heardquarters in 1938, yet the outbreak of war stifled those plans. Instead, the Supersam supermarket was built at the end of the 1950s, based on a highly original modernist design. Designed by Jerzy Hryniewiecki, the building became an icon for the times, yet it did not save it from demolition in 2006. The shopping centre that stands in its place is reminiscent of the classic towers of the Chicago school, paying heed to the pre-war intentions for the site, while also being accused of "ruining the Warsaw panorama" with its minimalist aesthetic and inspiring a number of protests from architectural circles and the public alike. Wood was the most widespread building material in Poland up until the 20th century. And wood is coming back into fashion, with more and more prominent projects using it as a primary material. 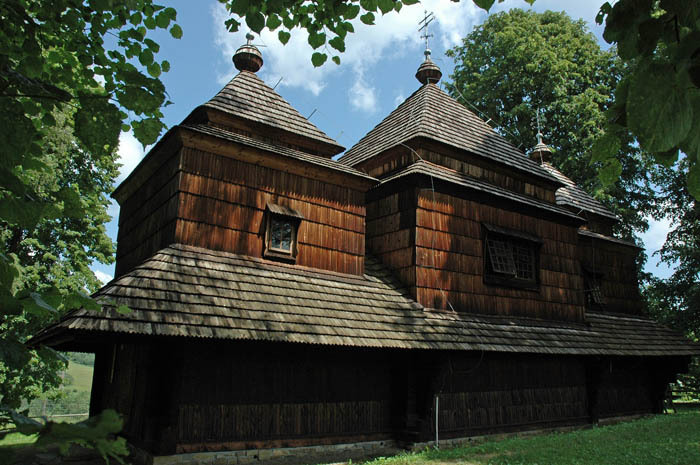 And the sacral heritage of traditional structures is also gaining recognition with Polish and Ukrainian Eastern Orthodox Churches being recognised by UNESCO. Built in the regions of Radruż, Smolnik, Turzańsk and Owczary these are the first landmark buildings in Poland to be preserved under international guidelines in seven years, following the Centennial Hall in Wrocławiu added to the UNESCO list in 2006. Poland's got a knack for building quick-and-easy pavilions for staging all sorts of activities - from exhibiting arts and crafts to selling fruits and vegetables, and even housing. Despite their ephemeral nature, these structures can boast a minimalist style all there own, gaining recognition even in the most hard-hearted architectural circles. Among the most eye-catching pavilions built over the past year are the Stacja Mercedes bar and club in the Powiśle area of Warsaw designed by Natalia Paszkowska, Marcin Mostafa, Agnieszka Dąbek and Michał Bartnicki of the WWAA studio, the Oktahedron Pavilion by the Center for Contemporary Art in Warsaw designed by Rirkrita Tiravaniji and the Quiosque of the Virtual Economic Zone in Gdańsk designed by Maciej Czeredys and Natalia Romik. 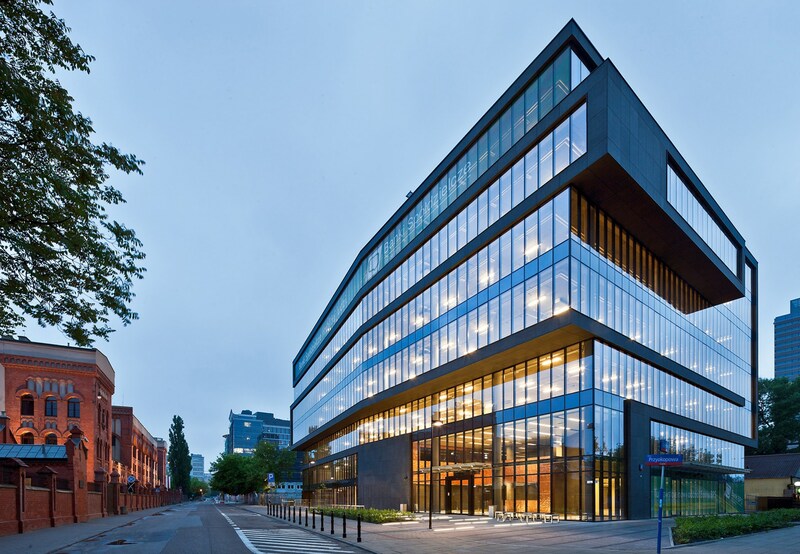 As many as 15 architectural projects originating in Poland have been nominated for the Mies van der Rohe Award 2013 over the past two years, ranging from eco-minded "auto-family" homes, department stores, courthouses, office buildings, schools, libraries and other public projects. 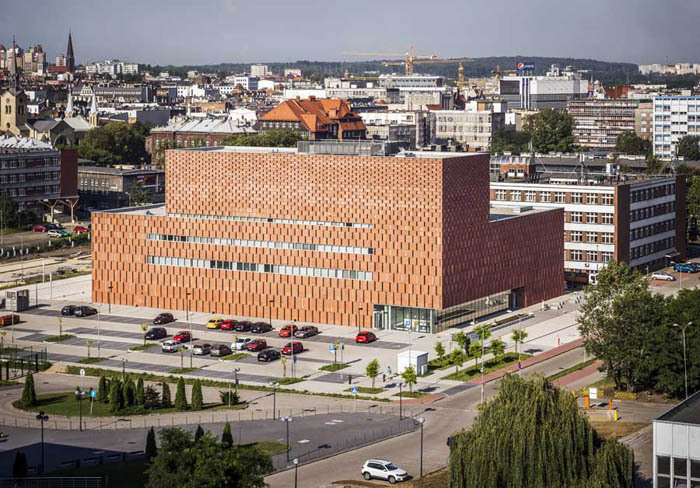 Among the buildings on the shortlist of this prestigious prize are: The Scientific Information Centre and Academic Library in Katowice, (Polish acronym: CINiBA, design: pracownia HS99), Wrocław Transfer Tunnel, (design: Maćków Pracownia Projektowa), and artist Krzysztof Wodiczko and architect Julian Bonder's Memorial to the Abolition of Slavery. Two Polish architecture students from Wrocław sweeped the grand prix in Germany’s international competition AIV-Schinkel-Wettbewerb for their fresh design for the Berlin-area airport. Dagmara Sietko-Sierkiewicz and David Wecławowicz's project transformed the existing structure into a functional complex for work, leisure and housing. The various parts would be dedicated to manufacturing activities, sports and leisure, and even a residential complex with a fruit-and-vegetable garden on the rooftop. The aim of the competition is not to realise the winning entry, but to stimulate creative thinking about the space and discuss various possibilities for its development. The Małopolska Garden of Arts in Kraków, designed by Ingarden & Ewý, was awarded the Brick Award for Public Building, a competition that honours projects that make novel use of the ceramic brick. The ergonomically designed cultural centre joins two cultural institutions, the Juliusz Słowacki Theatre and the Malopolska Voivodeship Library, on Karmelicka Street in the centre of Kraków. The building incorporates the century-old brick walls of the existing soda-processing plant and roof them with glass in a fully contemporary structure. It was also nominated for the prestigious Mies van der Rohe Award, and it was awarded first prize in the cultural-project category by Archdaily, as well as the Popular Choice award by Architizer. The Brick Award was also given to a Polish design team in the category of Multi-family Residential for Lewicki Łatak's eyecatching geometric housing complex in Wrocław, while the Museum of the Home Army in Kraków, designed by AiR Jurkowscy Architects, won for Best Renovation/Adaptation/Reconstruction. The winners were announced in April 2013 and will continue to be eligible for the international edition of the Brick Award 2014. The ergonomically designed Małopolska Garden of Arts, designed by Ingarden & Ewý Architects, was among the finalists in the Typology section of the prestigious architecture competition hosted by Architizer, a leading website on architecture. Maya's House, a backyard structure constructed for a little girl designed by Ultra Architects based in Poznań (Marcin Kościuch, Tomasz Osięgłowsk), received a Special Mention in the Landscapes and Gardens category. One of the most exciting projects of the year, garnering attention from all corners of the globe and its own New York Times editorial, was Keret House - Jakub Szczęsny's installation designed for Israeli writer Etgar Keret. Known as the world’s thinnest home, it fills a 1.3-metre gap between two houses – a pre-war building at Żelazna 74 and a communist apartment block at Chłodna 22 in Warsaw. 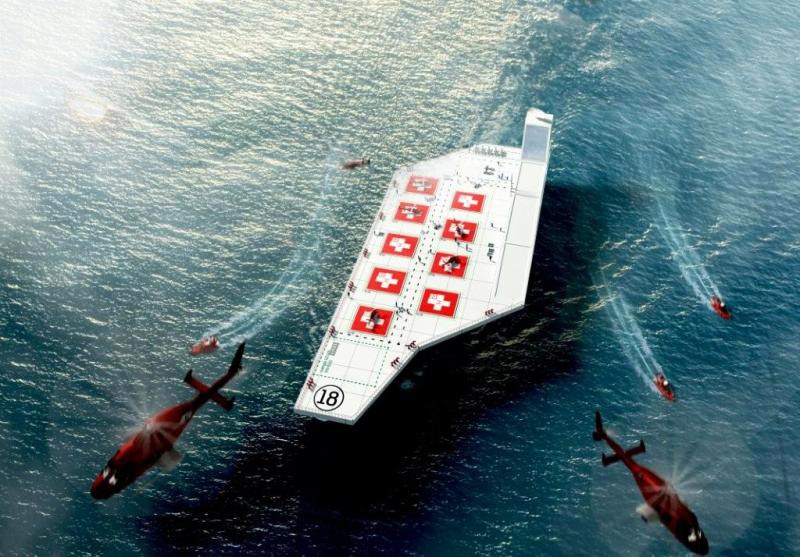 It is built on a triangular plane, with its widest side taking up 152 cm and the narrow end stretching over only 92 cm. 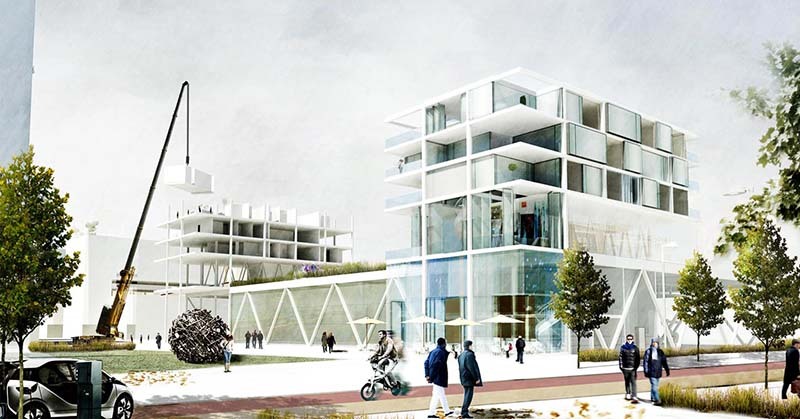 Kacper Radziszewski and Jakub Grabowski, students of Architecture at the Gdańsk University of Technology, received the First Prize and 3 000 euro in the San Francisco Fire Department Headquarters International Architecture Competition for Students and Young Graduates, hosted by ArchMedium. The goal of the competition was to find a project that would not only be functional, but would also act as a memorial to the admirable fire guards of the city, while stimulating the creativity of students of architecture from around the world. Second prize was awarded to a student of the Kraków Polytechnic University – Sylwia Franczak. Hugon Kowalski is the first Pole to win the Archiprix International / Hunter Douglas Awards for the world's best diploma project in the field of architecture. A student of the Art University in Poznań under the direction of world-class architect Robert Konieczny, he created a project that would transform the garbage dump in Dharavi, the largest slum in Asia, into a multifunctional complex for the people who live and work there. The fourth edition of the New Vision of the Loft contest, sponsored by the FAKRO window manufacturer in coopeartion with A10 New European Architecture magazine, singled out three winners for projects that envisioned a new type of loft space that used light and space in a novel way - and, of course, windows - while boasting energy efficiency. 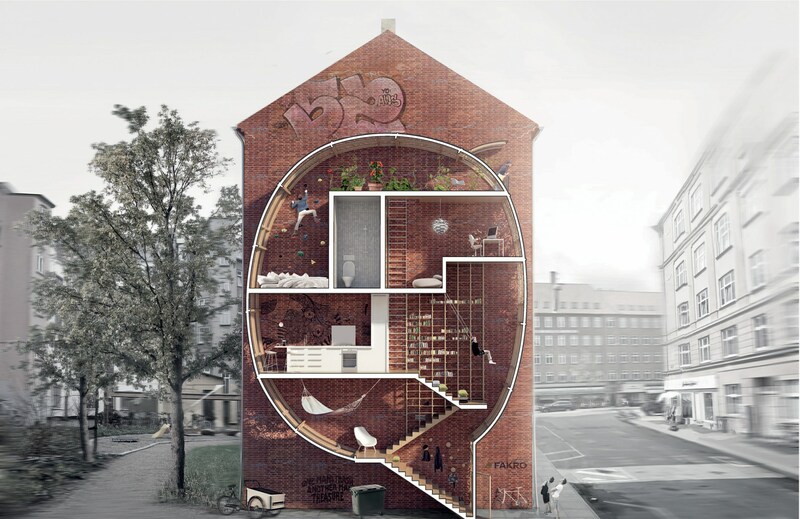 First place went to a narrow living space called "Live between Buildings" by Ole Robin Storjohann (DE, working in DK) and Mateusz Mastalski (PL, working in DK), Second Place to "Lock Loft" by Katarzyna Penar (PL, working in UK) and Wojciech Okrzesik (PL, working in UK) for their suspended house upon a bridge and Third Place to "Spacecraftsmen" adaptation of a former church space into a residence by Piotr Skrzycki (PL) and Dawid Szczepański (PL), along with five honourable mentions. The winning entry presented an innovative way for using empty spaces in nurban areas, mainly using windows as the construction material. 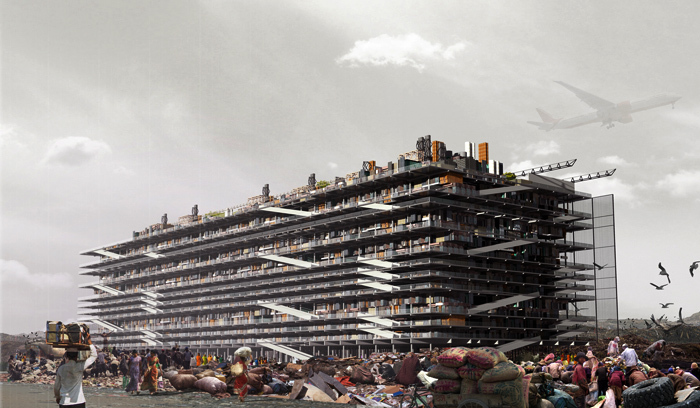 Ex.Terra, a project by young architects Marta Nowak and Iman Ansari is amongst the twenty-five winning proposals fostering creative debate on urban recovery in the Rockaways after Hurricane Sandy hit in October 2012. MoMA PS1 and MoMA’s Department of Architecture and Design initiated a call for ideas. for alternative housing models, inventive social spaces, urban interventions, new uses of public space, the rebuilding of the boardwalk, protection of the shoreline in the affected areas. Ex.Terra builds upon ground raised a dozen metres above sea level and introduces solutions that harness the elements of wind and water to protect the structure and provide energy for its residents.